Ben Robinson|GoBuccs.com Samantha Whiteman recently signer her letter of intent to play basketball for Trevecca Nazarene University in Nashville, Tennessee. In front are Jason and Nikki Angle (mother), Whiteman and Andy (father) and Nicole Whiteman. In back are Covington girls basketball coaches Adam Sweigart, Jim Meyer and Brandon Studebaker. COVINGTON — Whether it’s teasing her about her “weak” game or arguing about who won a one-on-one contest between the two, Covington coach Jim Meyer likes giving his senior basketball standout, Samantha Whiteman, a hard time now and then. When talking to Meyer about Whiteman, rarely does he not get in a little dig on the Lady Bucc star. 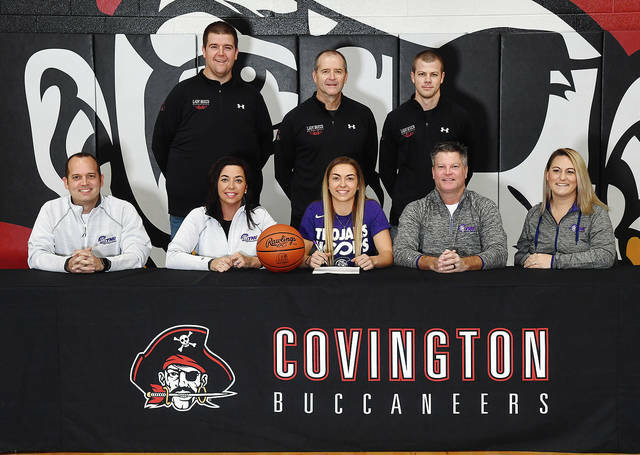 But Meyer was rather subdued last week at Covington High School as he witnessed Whiteman sign her letter of intent to play collegiate basketball at Trevecca Nazarene University in Nashville, Tennessee. Which made last week a bittersweet moment for Meyer and many of those who were on hand to witness Whiteman make her collegiate choice. That’s because there was a realization that Sammi Whiteman is in the twilight of an amazing basketball career at Covington High School. Whiteman is deeply rooted in her faith, which made the decision to pursue her education in Exercise Science at Trevecca Nazarene University an easy one for the Lady Bucc senior. For Samantha’s parents, it’s rewarding to see their daughter commit to the next level, but the fact that they will be able to continue watching her play makes it that much better. Watching her play is something her parents have enjoyed since she could barely walk as Sammi fell in love with the sport ever since she was old enough to pick up a basketball. And the unpredictable Ohio winters were never a deterrent. And as she got older and into competitive basketball, Whiteman took every opportunity she could to get into the gym — even it it meant pestering coaches to open up the doors before school or on weekends. It has all led to an amazing high school career for Whiteman as she enters her senior season ranked fifth in points scored in a career with 1305 points and third in average points-per-game for a career with 17.2. She also has scored the second most points in a season with 526 last year as a junior and fourth most in a season as a sophomore with 469. Yes, she is a once in a generation student/athlete. And for those who haven’t watched her play, make sure you take in a game this season. https://www.dailycall.com/wp-content/uploads/sites/30/2018/11/web1_sammi-signing.jpgBen Robinson|GoBuccs.com Samantha Whiteman recently signer her letter of intent to play basketball for Trevecca Nazarene University in Nashville, Tennessee. In front are Jason and Nikki Angle (mother), Whiteman and Andy (father) and Nicole Whiteman. In back are Covington girls basketball coaches Adam Sweigart, Jim Meyer and Brandon Studebaker.